Times Square has been in the process of being transformed into a permanent pedestrian haven, and yesterday, Mayor Bloomberg, NYC Department of Transportation Commissioner Janette Sadik-Khan and NYC Department of Design and Construction Commissioner David Burney unveiled the first phase of the revamped public plaza right in time for New Year’s Eve. The mayor and the Times Square Alliance celebrated the partial completion of the redesign with a ribbon cutting ceremony whilst standing on top of the area’s new granite pavers. The repaved pedestrian walkway stretching along 42nd Street and Broadway is just a small part of the Great White Way’s three-year, $40 million makeover to make the area more pedestrian friendly. Snøhetta, an international architecture studio that’s headed up many landscape projects around the city, was the mastermind behind the plaza redesign and Tully Construction acted as the project’s contractor. The new improvements pave over the cracked asphalt roads with granite pavers and aside from the walkway, the revamped Times Square now has a steel and granite map highlighting the Broadway theater district molded into the street on Duffy Square. The in-ground map can be seen on the triangle bound by Broadway and 7th Avenue between West 46th and West 47th Streets. Beneath the Times Square grounds, the city has put even more work into the first comprehensive subsurface street reconstruction in a century; including the replacement of utilities, electrical components, sewers and water mains dating back to 1904. A century-old streetcar tracks encased under multiple layers of asphalt was also removed. The project will temporarily come to a halt from December 27th through New Year’s Day for the big ball drop spectacular. With the first plaza space completed, work will continue between 43th Street and 47th Street until a scheduled completion in 2015. Once the entire project is completed it will add 140,000 square feet of permanent plaza space to Times Square. Meanwhile, there’s an even larger complete reconstruction of Seventh Avenue, which is expected to wrap up in 2016. Times Square has been in the process of being transformed into a permanent pedestrian haven, and yesterday, Mayor Bloomberg, NYC Department of Transportation Commissioner Janette Sadik-Khan and NYC Department of Design and Construction Commissioner David Burney unveiled the first phase of the revamped public plaza right in time for New Year's Eve. 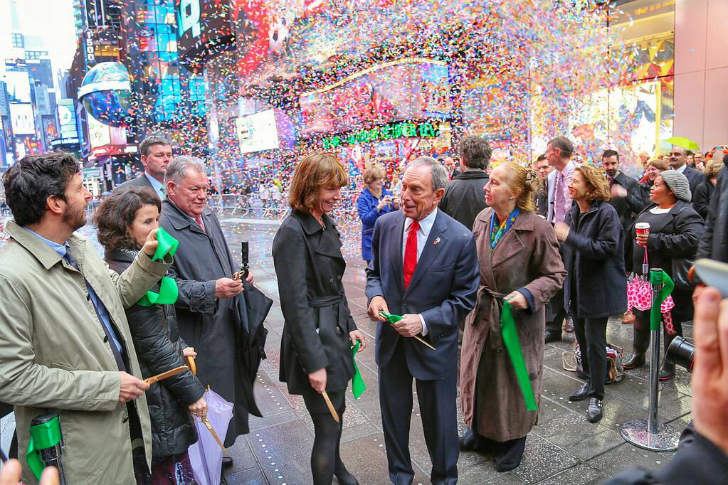 The mayor and the Times Square Alliance celebrated the partial completion of the redesign with a ribbon cutting ceremony whilst standing on top of the area’s new granite pavers. The repaved pedestrian walkway stretching along 42nd Street and Broadway is just a small part of the Great White Way's three-year, $40 million makeover to make the area more pedestrian friendly.